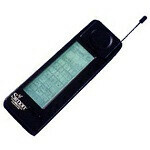 IBM’s Simon Personal Communicator was unveiled before the world on November 23, 1992 at COMDEX. Codenamed “Angler” at the time, this nifty device could handle phone calls, contacts, task list, “mail,” and third party apps believe it or not. It was finally released for sale through IBM’s partnership with BellSouth (now part of AT&T) in 1994. The Simon was available for $899 ($1,400 in 2012 dollars) on a two-year agreement within BellSouth’s 15 state network. Looking at the device by today’s smartphone standards does seem whimsical, but the fundamentals are the same, candybar form factor, touch-screen and it was a bit of a battery hog too. Before the Simon was taken off the market, the price had dropped to $599 and BellSouth sold nearly 50,000 units in six months (which is about how long many modern models last today). 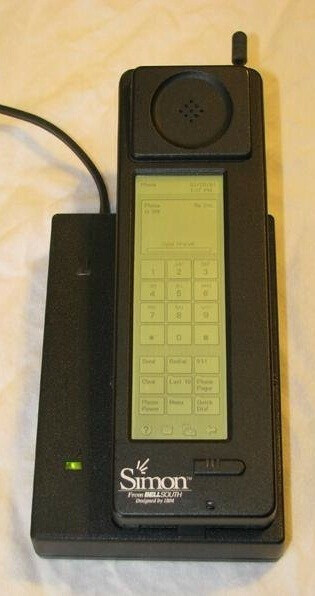 For its day though, the Simon was anything but low end, in addition to managing contacts, tasks, etc., it too sported a calculator, note pad, file manager and could even send and receive faxes (that is a method of sending text and images on a sheet of paper over a phone line for those that don't know). There was no camera, but there was an app for that. Third party apps would be run via inserting PCMCIA cards into the bottom of the device. The display was a 4.5-inch, black and white 160x293 LCD unit which allowed for input via stylus. 1MB of RAM was available and there was the option for expanding that storage by 1MB or 1.8MB using memory cards that were around at the time. Providing the power was a nickel-cadmium battery (it came with two), and processing that power was a 16MHz Vadem CPU. The Simon Personal Communicator was able to provide about one hour of talk time or less. That probably was not such a bad thing, since it weighed about 18 ounces and thus it would be a welcome break to put it on the charger for a little while. We will not try to guess where the technology will take us over the next 20 years. Given how quickly technology has advanced in the past four years, never mind the past 20, we are certain that any guess we make would be wrong. However, the first smartphone shares much with its contemporaries even at the ripe old age of 20. Nice one,IBM. what?a 4.5 inch display at that time?.... anyway,thumbs up for all users. 4.5 inch display and apple JUST NOW has finally gotten the idea of making their screens 4 inches, oh wow what a genious thought Apple! yeah.. i got my 10 inch for my phone ad.. apple so outdated right? Lies. Its only about 6 years old. Wow, 3 people didn't get the sarcasm?! "The display was a 4.5-inch, black and white 160x293 LCD unit which allowed for input via stylus." Input by a STYLUS? this is grounds to be added by Apple in a lawsuit guys. and calling, asha 305 and so one, not a smartphone. That's cute. By your logic, we may as well call any phone that can access email or the internet a smartphone, right? Then almost all most modern phones are smartphones. Basically, just about any phone that can access internet on the go is a smartphone on some level. @-box- YES PLEASE. The thing is, we label smartphones depending on their specifications. But the truth is, any phone as of now is a smartphone. @archeryhunter, you got that right. Perhaps, or if we differentiate between basic phones (no email/internet, no touchscreen, no physical QWERTY keyboard, candy bar or flip style body), feature/messaging phones (touchscreens &/or QWERTY keyboards, basic internet functions but no WiFi) and smartphones (all the goodies) and understand the levels, we can keep the definitions up-to-date. Much like how more advanced options and features in cars eventually trickle down to even the basic vehicles, we don't call a new basic car with multiple airbags and CD players luxury cars, but 20 years ago that would have been reserved for the high-end luxury set.. I would kill a fanboy to own this. The great reign of Motorola and Nokia. I see a home and back button on screen buttons. This thing was ahead of its time. Looks like IBM is another company that doesnt get enough credit in the smartphone world.